THE V05 EXPERIENCE IS AVAILABLE FOR BOOKING FOR YOUR EVENT/CONVENTION/THEATRICAL VENUE – Contact us for more details! HBO WORKSPACE! 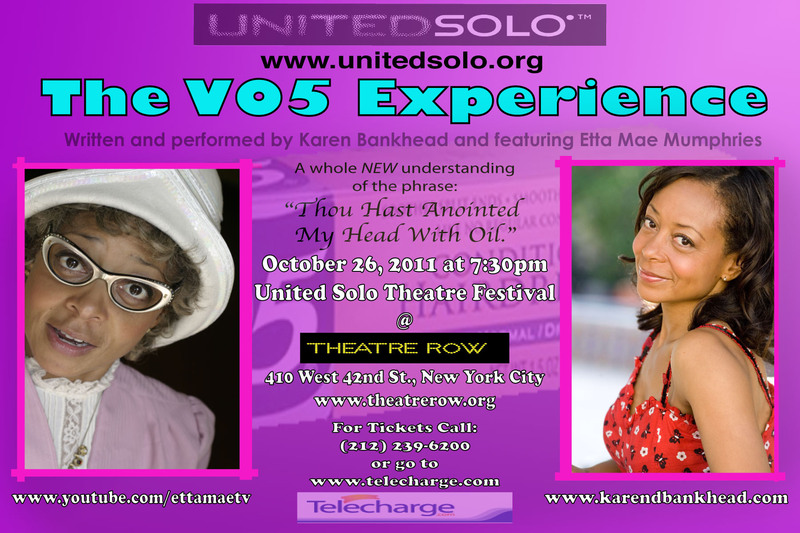 – UNITED INTERNATIONAL SOLO FEST NEW YORK CITY FEATURED ARTIST! SAN FRANCISCO FRINGE FESTIVAL! – IRA ALDRIDGE AWARD – PLAYWRITING! 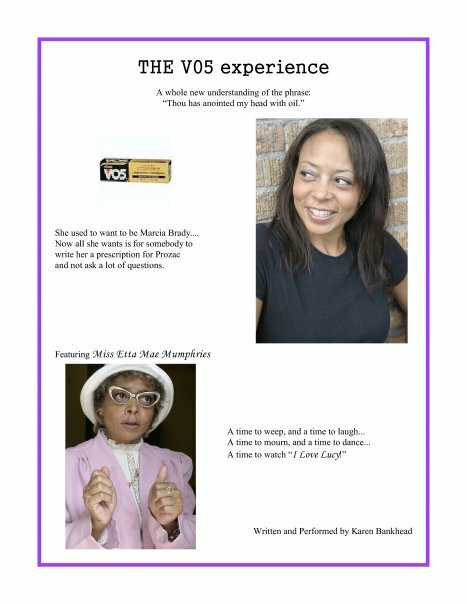 The “THE VO5 EXPERIENCE,” chronicles the trials, tribulations and uplifting hope of an actress of color, who doesn’t know if she’s hip enough and is waylaid by crippling depression, ultimately calling on God, triumphing and restoring her faith. Karen remarkably portrays a rapid fire succession of several lovable and hilarious characters and the show can be presented in it’s entirety (approximately 50 minutes) or in just the crowd pleasing segments: “Sunday School,” “The Decision Dance,” “The Miss Belle Show featuring Sunny Lee and Corvette,” and “Etta Mae Mumphries. “The Decision Dance” from the V05 Experience. Click these links to see positive reviews! Loved the performance! Family friendly and wholly enjoyable – laugh out loud funny! My daughter and I enjoyed your performance in San Francisco. Lots of smiles and joy! Thanks for the laughter and the giggles. We are looking forward to seeing you perform again soon. Thanks, Rebecca! I was delighted to see you both again, and can’t wait to come back to the Bay Area! God bless! You do the Big Apple, Karen. You’ll be great! Thank you so much, Tall Pajama Man! Keep up the great writing, sir!